Bring the holidays into your home this season in some beautiful ways! Kids and adults alike can marvel in the wonder of the season. Turning your home into a winter wonderland can be easier than you think! How about adding a few candles to the fireplace surrounded by fresh or faux greenery. A few bows or ornaments and a string of lights can make it festive without costing too much. If you're in the market for new stockings, this list of 30 beautiful stockings are some of the most unique ones I've seen. Of course the Christmas tree is center of the holiday decorating in most homes. 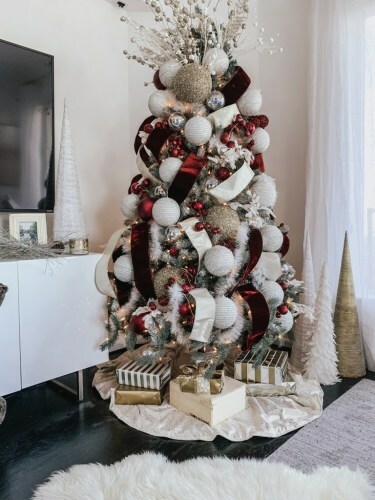 Here are some tips to get a picture perfect tree. I was inspired by one of my favorite blogs, DressupButtercup. Her tree this year looks so polished and contains a few elements worth mentioning. The tree is first srayed with fake snow which I think gives a nice winter wonderland look. Then ribbon is placed throughout which adds volume. I love the use of different sized ornaments to give a nice variety for the eyes. For more tree design inspiration, scroll through this list of 40 extravagent Christmas trees. Holidays for many people mean having family or friends come to stay at your home. To get your home in perfect shape for your guests, be sure to check out our selection of ceiling fans, lighting, rugs, lamps, mirorrs, art and furniture! A cozy new rug might be perfect in a guest room. Or one of our new Zoe Bios Creative prints might be the great way to start a conversation.